How did you work to make the “OneHealth” conversation relevant and what does “OneHealth” mean to you? From the very beginning, I was very excited to raise awareness about animal welfare and zoonotic diseases within the scope of One Health as a part of my project in Sangkhlaburi. I was able to start several projects in the area. The local market in Sangkhlaburi, and the weekend market in particular, is a natural meeting point for locals, urban Thai tourists and foreigners. The marketplace became the perfect place to communicate with a huge number of people, telling them about our work, the importance of One Health, and we gave them some information to take home. 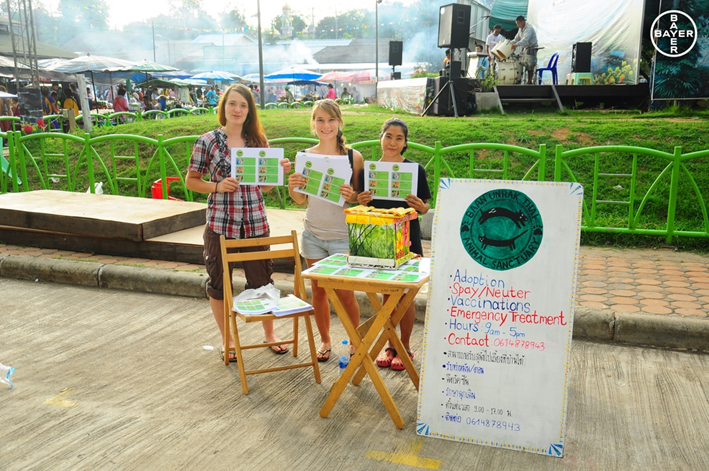 During our time at the market, we explained the Thai Animal Sanctuary’s objectives, answered questions on the importance of spaying and neutering pets, zoonotic diseases, animal husbandry, and offered quite a show when we engaged with the crowd to catch stray dogs for our spay and neuter project. Together with the international volunteers we created posters, painted signposts and designed flyers (in english, thai and burmese) to reach as many people as possible, and to make it easy to reach out for our help at the clinic. Many local women at the market were incredibly supportive and distributed additional flyers to their customers as well. This made our outreach even greater and our participation at the market not only fun, but also very successful. Catching dogs at the market throughout the day, where many people could see that we were working proactively for the community's wellbeing, was important to gain the community's trust and to engage them in our work. To me, the engagement of local people, raising their awareness and making them value population and disease control and therefore increase the animal health within their community is the key to a sustainable health balance in such a shared environment. Reducing the number of stray dogs in the future through spaying promotes health for those that remain through an adequate food supply, a decrease in fights over territories and lower pathogen pressure and risk of the spread of disease through crowding. For people this means less aggressive dogs and therefore a decreased risk of injuries and infections with zoonotic pathogens (particularly also through vaccination of street dogs against rabies, one of the most important zoonoses in Asia) and therefore a more positive attitude towards their dog population. One Health in a nutshell! We knew this concept was really making an impact on people everywhere in the area when we saw local minibus drivers using their buses to transport sick street dogs, from the bus station to our clinic, because they worried about the health of this stray animal. Another important way of engaging the community was by involving kids from the school and children’s home next door. Adjacent to the animal clinic and dog sanctuary, there is a school for children as well as a home for children with physical or mental disabilities, or challenging family backgrounds. Getting these children more involved with our work was another great way of changing people's minds towards animal health and welfare. We found that children are naturally open and curious, and they took their experiences from our clinic home to their families. For us this was special, because they were actually creating a bridge between our international group of volunteers and the community. We engaged them by having them spend time with our cute puppies in the sanctuary and joining us for dog walks. Some of the kids were able to take responsibility for a dog for an entire afternoon, or a day, which made the lives of both children and dogs a bit more varied and interesting. This helped us promote our dogs’ welfare and socialisation. Some children were very interested in the clinic’s work and were given small tasks to perform. We also took the opportunity to answer a lot of questions about our animal-patients and hopefully we inspired a future veterinarian along the way! It was extremely exciting to see everyone engaging and growing together in such a short period of time, and I am both happy and very proud to have been a part of it.